The tgoma game system for a Springfree trampoline is about a lot more than just playing games. It’s a robust platform for kids and adults – you can track activity, set goals, participate in global competitions and more! Check out these six features in tgoma that you might not have heard about! 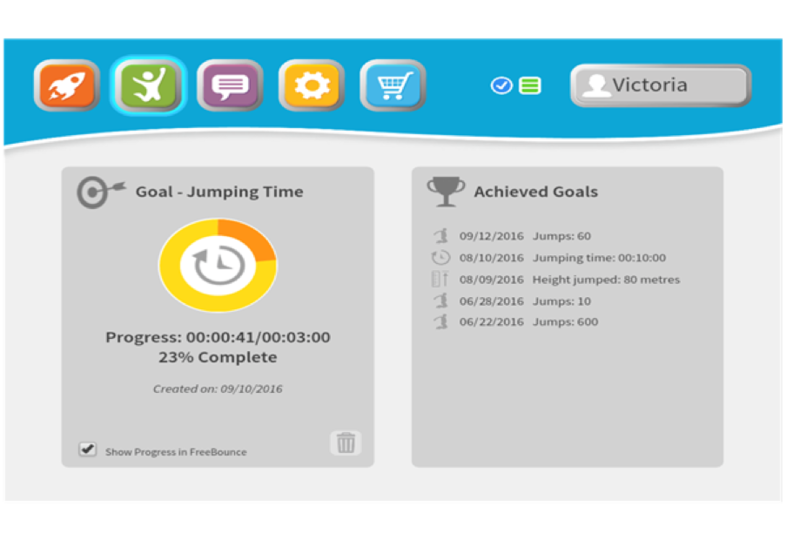 Within tgoma you can set personal goals like number of jumps, time spent jumping, calories burned, and even how high you jumped. Goals are tied to each user in your account and once achieved are displayed in the Achieved Goal section of your personal profile. Goals can be found in the green JumpFit section of the app. Setting goals gives you a great way to track and see your progress. It can even be used as an incentive for kids! For example, you can set a goal of 100 jumps before they can get a chocolate bar or cookies. Or create a family competition of the first person to reach 1,000 jumps doesn’t have to do the dishes. And tgoma will show you when they have achieved that goal. Jump Tracker is another great tool to see your progress and history on tgoma. Displayed in green JumpFit section of your user profile. 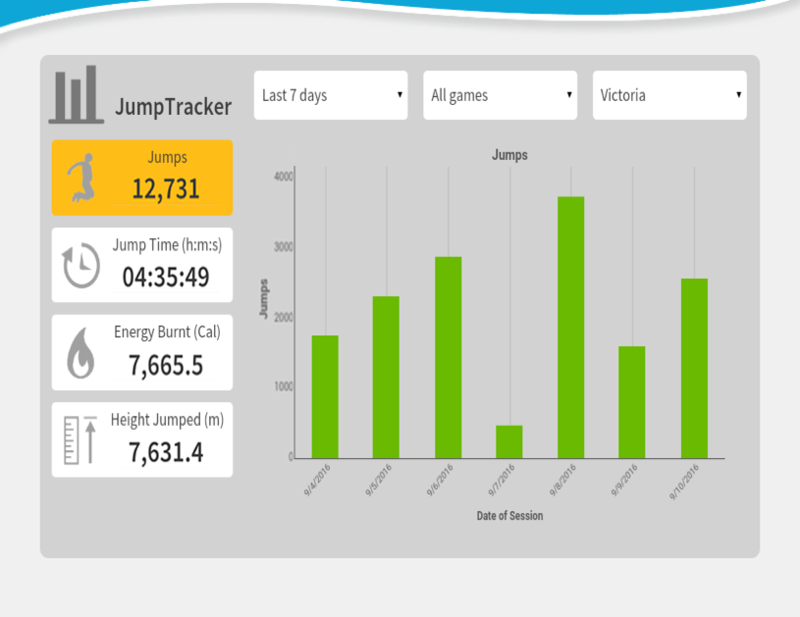 Jump Tracker allows each individual to track jumps, time spent jumping, calories burned and height jumped. You can even filter all that data by day, week, month, year, and even by game! So you can see how many calories you’ve burned in the last month and which games give the you the best workout. It’s important to set up your own personal profile in tgoma. We talked a lot about tracking jumps, jumping time, and calories burned – all of which are tracked on your individual user profile. Why should you set up your own profile? Entering your weight allows tgoma to accurate measure calories burned. 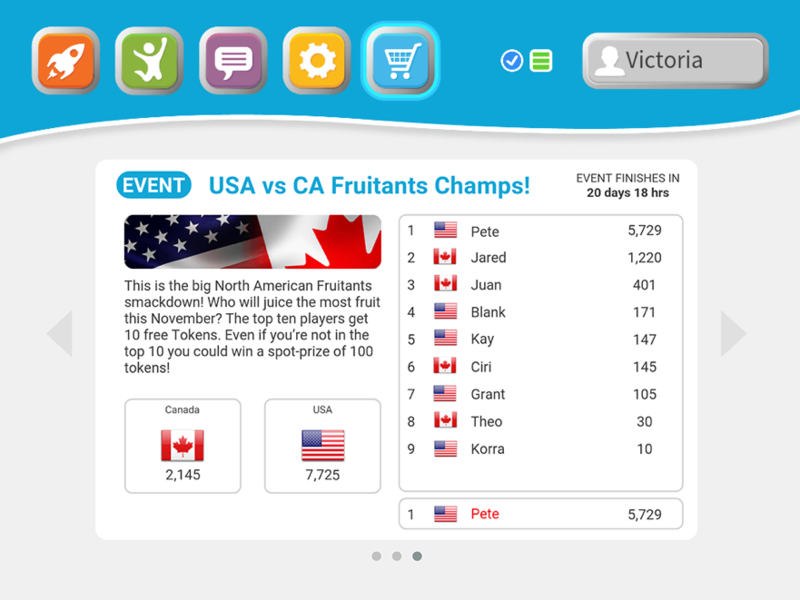 User profiles are shown in tgoma competitions and game leaderboards. See where you rank against other users worldwide. Plus, you can have as many profiles as you want in your tgoma family account. 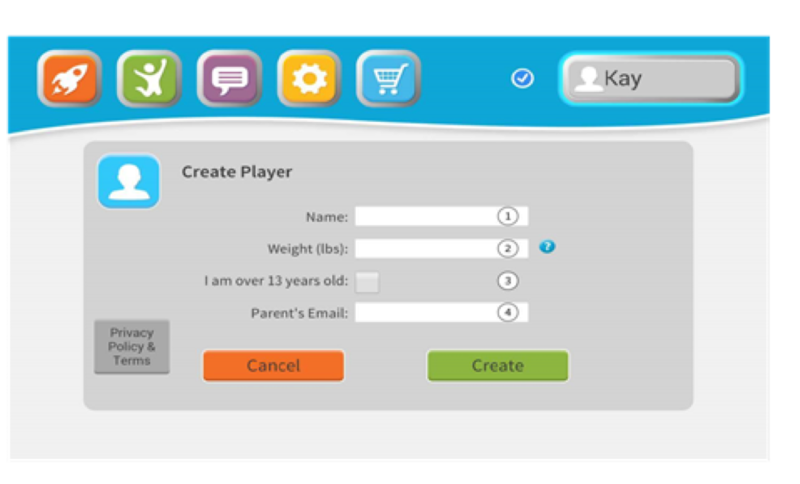 So your kids’ friends can set up their own profile and compete against each other for highest score and bragging rights. 4 – Games Are Free! All games on the tgoma app are free and there are currently no in-app purchases. New games are automatically added to your account at no extra cost. We’re frequently adding new games for all ages to keep giving you new challenges and high scores to beat. Tgoma lets you compete against jumpers all over the world. Plus, there’s no need to sign up – if you play the game you’re already entered to win. Check your competition ranking in the purple News and Events section and see how you stack up against other jumpers. Every month jumpers rank in the Hall of Fame to claim the title of Global Jump Star. Based on the most jumps in a month, discover if you’re one of the top jumpers in the world and where you rank. Just go to the purple News and Events section to see. 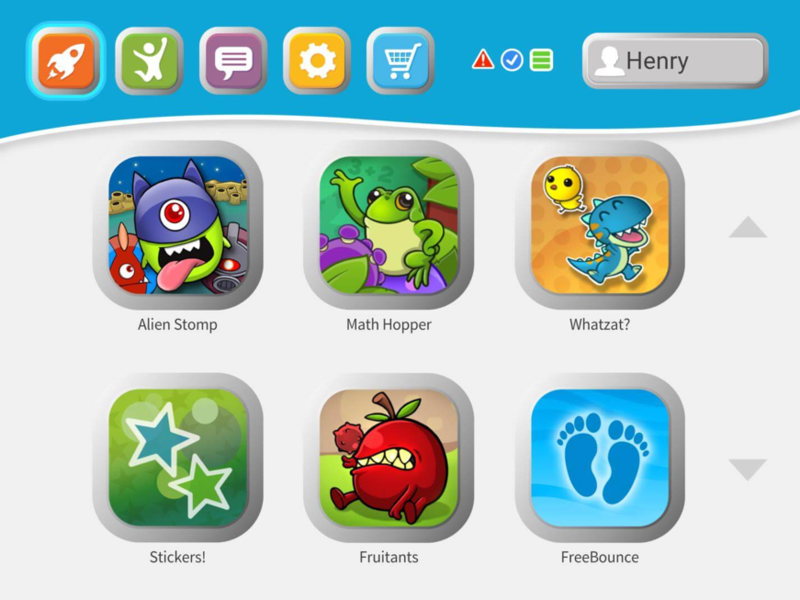 Plus, many games have their own leaderboard like Alien Stomp, Fruitants, Pop, and Snake. 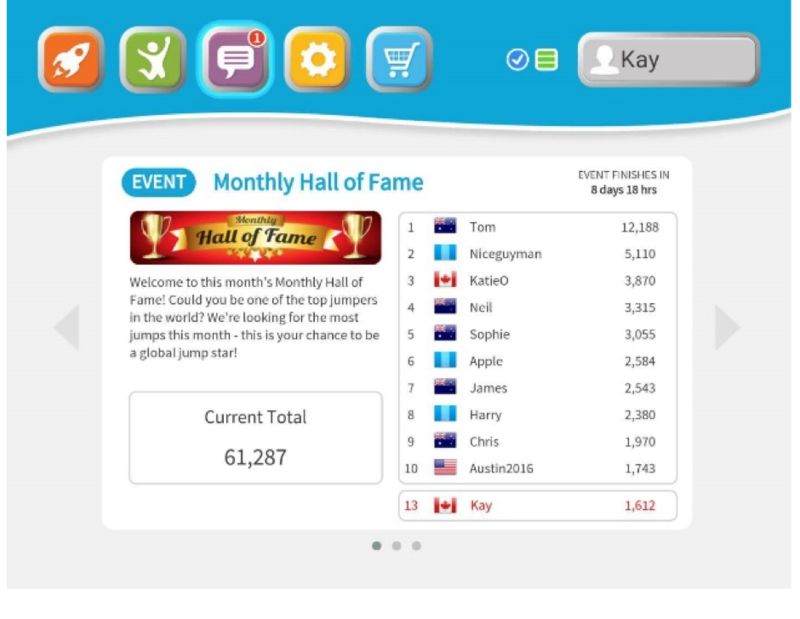 These leaderboards showcase the top scores for all players in your Family Account AND a global leaderboard for top score around the world. TIP: While tgoma does not require a WIFI connection to play, you need to be connected to WIFI to view leaderboards. The tgoma game system is a great way to keep you and your family active. Need help setting up your account? Follow these three easy steps and you’ll be bouncing in no time!